Lionel Messi scored his second successive La Liga hat-trick as Barcelona claimed a 4-3 win over Real Madrid to keep title hopes alive. Andres Iniesta shot the reigning champions into the lead with his first El Clasico goal, but Karim Benzema’s brace pulled Carlo Ancelotti’s side ahead before Messi’s hat-trick undermined the efficacy of a Cristiano Ronaldo goal from a controversial spot kick. A 90 minutes of high-octane football at the Estadio Santiago Bernabeu did not end without some questionable decisions with the game producing three penalty calls and a Sergio Ramos red card. 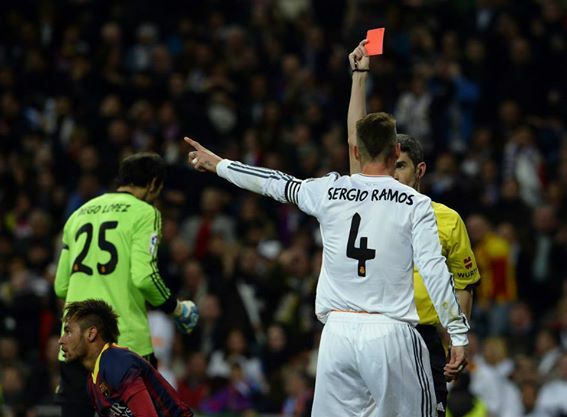 Sergio Ramos Sent Off For a Career 19th Time in Sunday’s Explosive El Clasico. Getty Image. The unfortunate defeat to ten-man Real leaves them second by virtue of their head-to-head record with neighbours, Atletico Madrid, who earlier in the day secured a 2-0 win at Real Betis to climb top, tied on 70 points with the Los Blancos. Barca are now a point behind the capital sides and could still claim the treble this season with the Copa Del Rey final coming up on Wednesday 16, April and having advanced into the quarter-finals of the Champions League, where they hosts Atletico same month. Andres Iniesta Celebrates His El Clasico Opener at the Bernabeu. Iniesta silenced the Bernabeu crowd within seven minutes of kick-off, hammering a fantastic shot past goalkeeper Diego Lopez off a Messi assist. Real pressed forward for an equaliser and Benzema should have restored parity moments later only to let fly his effort after some link-up with Angel Di Maria. The French striker couldn’t help but to make it count on his second attempt on 20 minutes when Di Maria delivered a neat cross from the left, he rose to head past Valdez, whose slight contact couldn’t stop the ball from going inside the net. Karim Benzema Leveled for Real on 20 Minutes. AFP. Di Maria, again provided another fantastic cross to the striker four minutes later and Benzema flicked an effort past Valdes to place Real ahead. Messi drew Barca level with his 19th record goal in an El Clasico fixture, after trading one-two pass with Brazilian Neymar, the Argentine sent a low shot past Lopez. 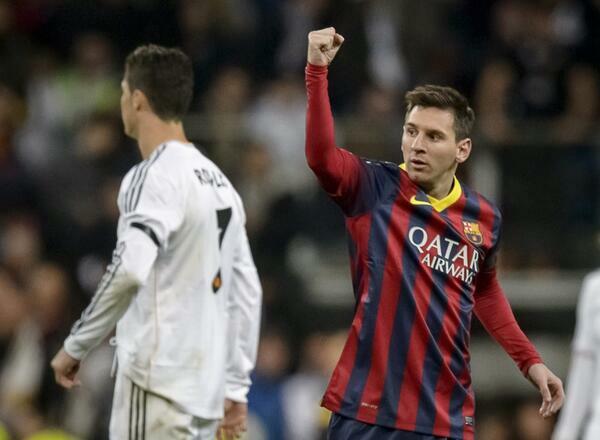 Lionel Messi Beat Alfredo Di Stefano’s El Clasico Hauls With His First Strike on Sunday. Both teams went into the break leveled 2-goal apiece with the hosts however ruing some missed chances. The nervy calls began creeping in in the second-half, first; Barca were left fuming when Ronaldo won a penalty decision after being fouled by Dani Alves, though replay showed it was outside the box. The best footballer in the world from last year stepped up to convert from 12 yards and Real got in the lead for the second time of the night. 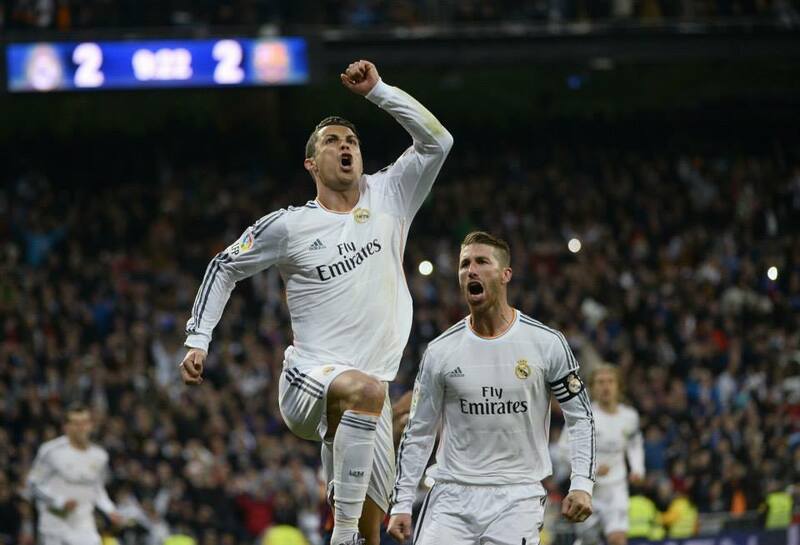 Ronaldo Made it 3-2 After the Break But Lionel Messi Had Some Cute Penalty-Taking Skills Up His Sleeves. Defender Ramos then clipped Neymar en-route into the penalty area- but there was minimal contact. The infringement earned Ramos his 19th career red card and Messi stepped up to grab his brace and draw Barca level again. 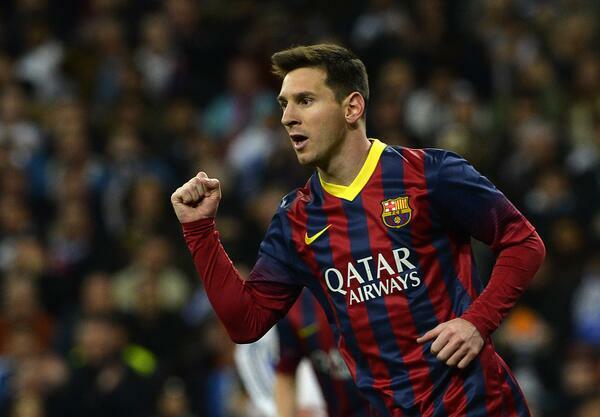 Lionel Messi’s Second Goal on Sunday Night Made HIm the Second Highest La Liga Goal Scorer. AFP. The equaliser made the Argentina captain the second top goalscorer in the Spanish League history with 235 goals and he went on to grab his hat-trick- though from another soft penalty decision- to edge closer to Atletico Bilbao legend Telmo Zara’s record (252) by 16 goals. Most significantly, Messi became the first Barca player to ever score a hat-trick at the Bernebeu. Elite Players Heightens Handball Federation Crisis as They Join Suit With Veterans. Galatasaray Clinches Their 19th League Title at the Weekend. Rodgers: Rafa will get a Rousing Reception at Anfield.